It's a pair of cameras each but who wore it better? We all know the iPhone did it first, and Samsung's a little late to this party. And yes, we all know that between these two it's not really a 'hey, you've got the same shirt, let's hang out together' moment - no, it's more like 'look the other way and pretend they're not there'. Some prelude to a camera shootout, isn't it? Because that's what we have in store for you, an iPhone 8 Plus vs. Galaxy Note8 one-on-one. Apple was the first to do a wide+tele camera on the iPhone 7 Plus (each of them only moderately wide or tele, strictly speaking), with other makers opting for different ways to beef up their camera credentials. A generation later, the iPhone 8 Plus comes with essentially the same specs, but new sensors and improved processing. The Galaxy Note8, on the other hand, is the first of its kind for Samsung - a smartphone with a dual camera, that is. And which exactly path did Samsung take? The one lined with apple trees. Don't get us wrong, the wide+tele arrangement is the one to have - even if we're far from a consensus on this one, the number of actual phones owned in the office points in that direction. And it's only natural that Samsung would target its archnemesis, instead of shooting in the dark, right? 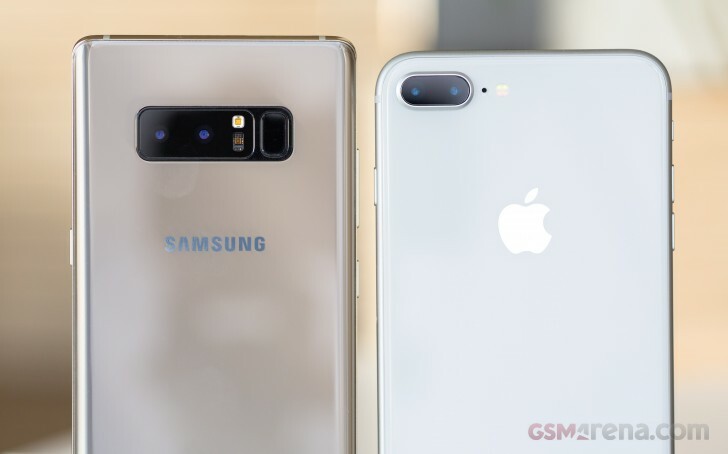 But in the dark the Galaxy Note8 can shoot too - both of its rear cameras have larger sensors behind wider aperture lenses than what the iPhone 8 Plus has. Same for the selfie cam. Where the iPhone is unrivaled, a quick look at the specsheet will tell you, is video recording - 4K/60fps is a first on a phone, and so is 1080p/240fps slo-mo. The Note's slo-mo is a more pedestrian 720p/240fs, and 4K recording is only available in 30fps. If you need a refresher on the numbers, this next table will come in handy, but for the detailed spec sheets our compare tool is the way to go. Believe it or not, we'll actually be looking at image quality too - because numbers can only tell so much (right, DxO?). But before that, let's go over the specifics of the camera hardware and the software side of things. But for that the Note 8 came out ahead.